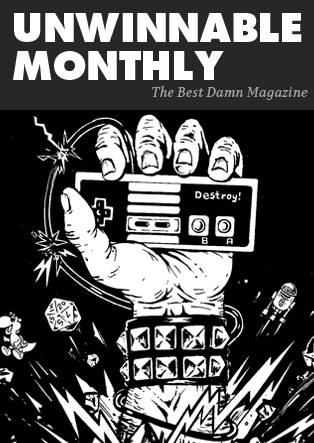 This is a reprint of the letter from the editor in Unwinnable Monthly Issue 98. You can buy Issue 98 now, or purchase a monthly subscription to make sure you never miss an issue! Welcome to our final issue of 2017. We had a great time putting together this issue, and all the other issues this year. We hope you’ve enjoyed reading them as much as we have writing, editing and designing them. Only two more until #100! This month’s cover story, by Maxwell Neely-Cohen, takes on Crusader Kings II, a game I’ve been addicted to for years and has consistently defied my attempts to explain why. Max does a great job of, if not solving the riddles of CKII entirely, collecting them in a way that they suddenly make a different kind of sense. 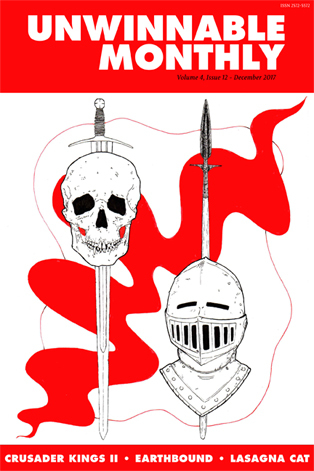 Hank Drago is the artist behind the cover, which does a great job of capturing the feel of CKII’s obsession with death and lineage, while also being strangely holiday appropriate. Quite the accomplishment, I think? More on Hank in the Artist Spotlight. We have two more features for you. Jun Wilkinson discusses how localization shaped the classic SuperNintendo RPG Earthbound and ruminates on how localization should be approached in the modern era of videogames. The other marks the return of our friend David Wolinsky, who chats with Fatal Frame, the creators of the Lasagna Cat YouTube series about comedy, stupidity and the internet that was. Finally, our sponsored Q&A is with Nathan Rowe, the man behind the VR app SculptrVR that allows you to both create and destroy worlds. The columns are as eclectic as ever. Yussef Cole’s debut column is particularly noteworthy, as it looks at Jack King-Spooner’s game Dujanah and the balancing act between postmoderninst recontextualization and cultural appropriation. Gavin Craig delivers a list of his hopes for 2018. Meg Condis checks out the documentary Living Dolls and digs into why we think dolls are creepy. Casey Lynch rounds up the best metal albums of the year (I think you’ll be surprised by his top honoree). Meanwhile, Matt Marrone picks his own album of the year and is similarly surprised. Brock Wilbur replays Stubbs the Zombie and regrets almost every minute of it. Deirdre Coyle hangs out with Fortnite’s Phase Scout Jess and talks about anarchy. Corey Milne wonders about Neir: Automata’s approach to saved games says about the game’s message. I discuss how Assassin’s Creed Origins changed my perception of ancient Egypt (and maybe my perception of perception). Sara Clemens runs like the wind, Rob Rich mourns through videogame Let’s Plays and, finally, Jason McMaster makes us jealous that he has Gloomhaven and we don’t. If you haven’t visited Unwinnable.com recently, I encourage you to do so. Brian Taylor and I spent the last few months redesigning it to make it a bit friendlier and have the focus fall more squarely on our regular contributors. Of particular note is the new Best of Unwinnable section, curated by Sara Clemens, that will focus on surfacing great writing from our seven-and-a-half-going-on-eight year history. We also have a newsletter sign-up so you can get the best current Unwinnable stories directly in your inbox. Best of all, the new design also incorporates much more paisley than it did previously. Before I let you get to the rest of the issue, a serious note. I sincerely hope this letter from the editor finds you well. 2017 was a challenging and exhausting year and 2018 promises more of the same. I, and the rest of the team, particularly managing editor Amanda Hudgins and social editor Melissa King, have strived to make Unwinnable a welcoming place for writers of all backgrounds, where we can discuss the things that matter most to us without constraint, be they silly or serious. We could not have done this without you, our subscribers, and we can not adequately express our appreciation for your support. Whatever holidays you celebrate this December, I hope they bring you joy; whatever comes with the new year, I hope you find all the happiness and resolve and peace that you need.